As part of my Running my business from an iPhone 6 Plus project, I need to access computers on my LAN at work from my iPhone 6 Plus while traveling. 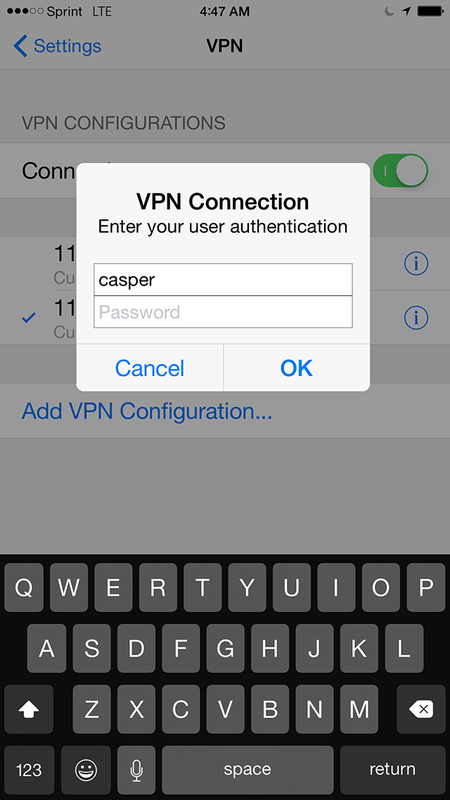 After trying several approaches, the best solution seems to be through setting a VPN (virtual private network), which allows my phone to make an encrypted connection to my LAN at work. 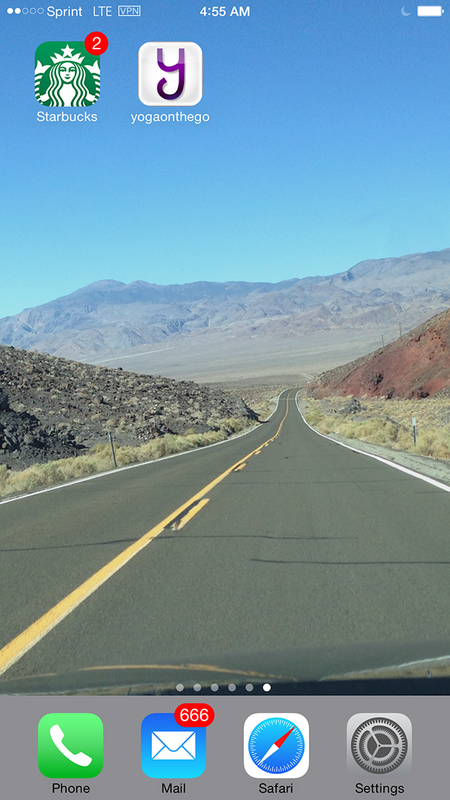 This provides secure access to all of the resources I have there, which I’ll cover on a separate blog entry. 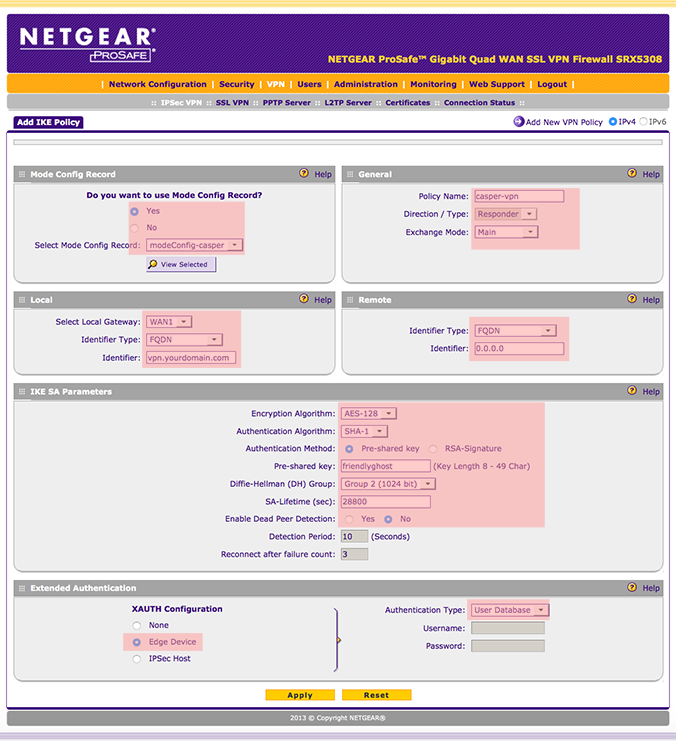 My firewall/router is a Netgear SRX5308, and over the years, I’ve tried setting up a vpn to my iPhone, but never succeeded. 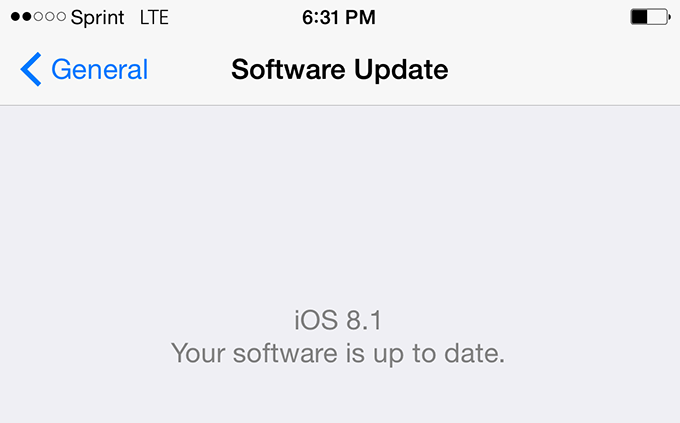 This time around I did get it going with IOS 8.1. 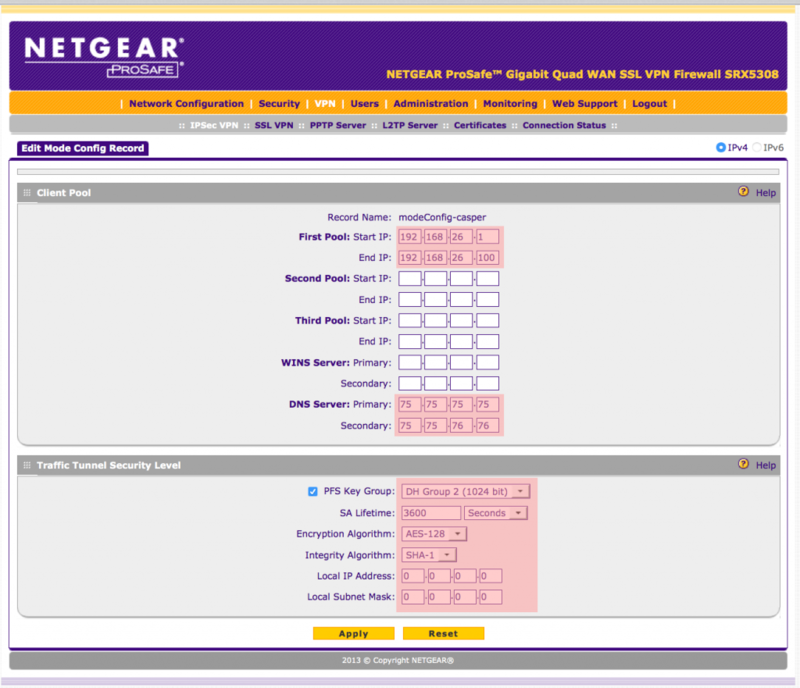 The second pink area specifies the DNS servers that computers on your LAN see… Filling these in allows your remote device to lookup and browse computers that are not on the LAN. Select “Yes” and the name of the mode Config, i.e. modeConfig-casper. Under Local, specify the FQDN of the WAN, or IPADDRESS and the IPaddress of the wan. 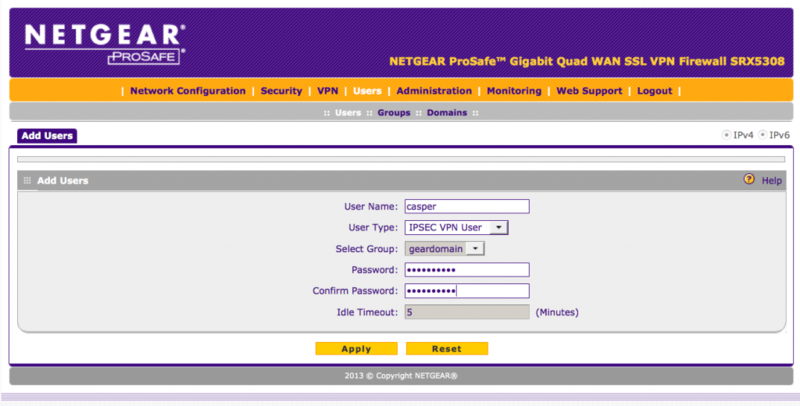 You would put your FQDN of the wan address where ‘vpn.yourdomain.com’ is on the above image. 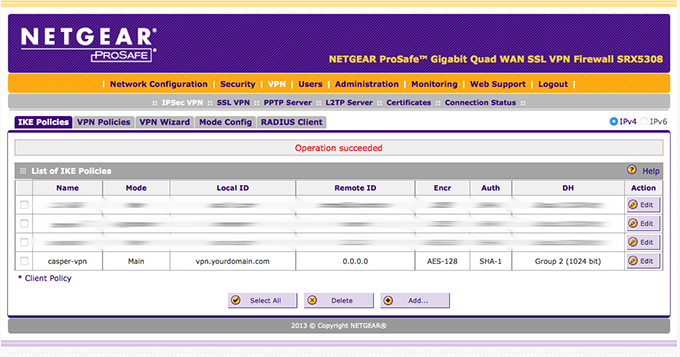 For Remote, select FQDN, and type in 0.0.0.0 This allow you to log in from any ip address. For IKE SA Parameters, select AES-128, SHA-1, pre-shared key, type in a keyphrase (our example uses ‘friendlyghost’), DH = Group 2, SA-Lifetime = 28800, Enable Dead Peer Detection = no. That’s it for the SRX5308 setup. Staying up to date is generally a good practice… in this case, it’s mandatory. Then, fill in the values for the VPN that we just setup on the router…. You get a VPN annunciator at the top of the screen, indicating that the VPN connection is active. 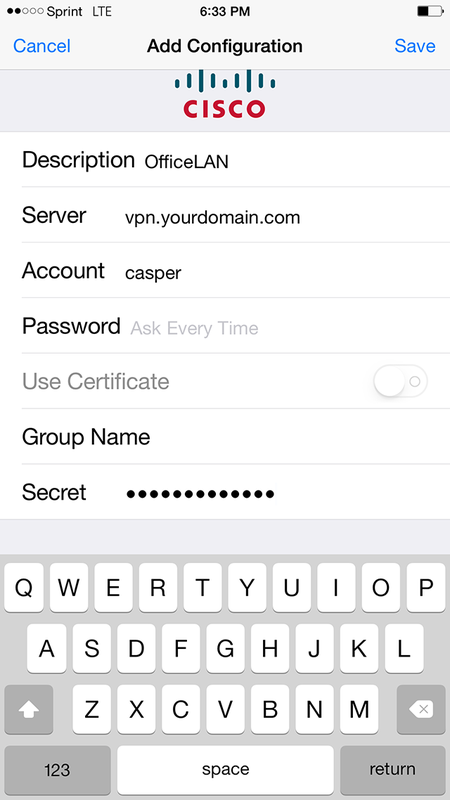 This entry was posted in Home Networking, iPhone, Mobile by admin. Bookmark the permalink. It has been an extremely frustrating effort trying to get my ipad working with vpn to my SRX5308. Finally works! Thanks for your excellent tutorial on this, go it working now in 5 minutes! This is perfect, thanks. However, once the VPN is active I still cannot browse to anything, external or internal. Ideally I need to browse using the iPad safari browser to my intranet site or external sites such as net gear.co.uk, plus others. 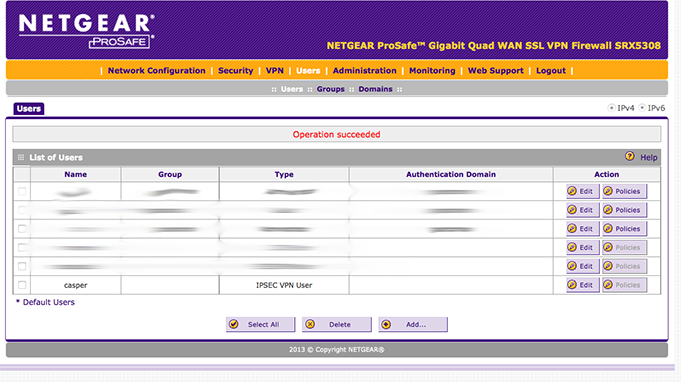 It there something else I need to do, with firewall or ports or routing maybe to complete the process? Hi Dave, The article and settings are what I use, and I can browse both on the LAN and on the internet. It works with both an ipad and an iphone.